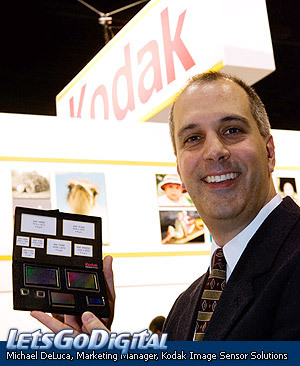 Today, March 1st 2006, at the Photo Marketing Trade Show (PMA 2006), held in Orlando we met Michael DeLuca, marketing manager image sensor solutions (ISS), from Kodak. We took some time to set up a Q&A session at the booth from Kodak, and asked Michael all about the image sensor industry and its developments. Question: Please introduce yourself. What is your task at the company and please tell us some more about your career? 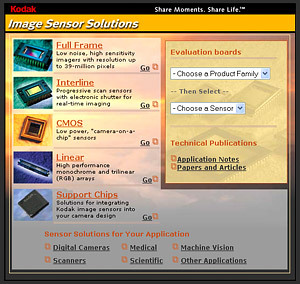 Answer: Ok, my official title is Marketing Manager Image Sensor Solutions, or ISS. I am responsible for the communication of the outbound products we are producing. I have been working for Kodak for almost 12 years now and have been working on digital still cameras as well as photolab products. The camera division is just one aspect the market ISS is working with, beside this market we are involved in several other markets, like the medical one. 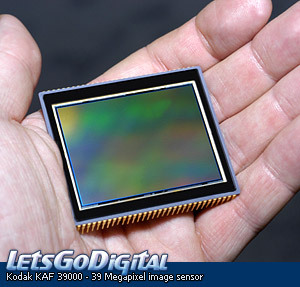 Question: We see at the entry-level of the digital imaging market that mainly CCD sensors used are used. Looking at the D-SLR market we see a variety of sensors, some CMOS, some CCD and in the digital back CCD again. Can you give us an explanation of this segmentation? Question: Do you think that this Megapixel race will ever come to an end? And what do you think will be the end of the amount of pixels? Answer: We, as ISS, are not involved in the entry-level digital camera market, we are mainly focusing on the advanced and professional user market. In the middle segment there is actually one important player who is using CMOS sensors, obvious we are talking about Canon. This segmentation is Canon's work, and Canon's work only, no one else. In fact the CCD image sensor has been developed especially for capturing images. So it would be logical to say that a CCD sensor provides the highest image quality possible, which should be superior to the CMOS sensor. However, the fact that Canon is getting high quality end results out of the CMOS image sensor is the result of the effectiveness of the chip that is converting the signal, the DIGIC II processor. The back draw of the CCD image sensor is that it only records voltages. So around the sensor there must be other chips who take care of the rest of the process. With the CMOS the other chips are integrated into the sensor. Therefore the power consumption will be lower, but it will infect the image quality. Answer: It depends on two things. First, it is just a question of demand. What is that particular market asking for. For digital back sensors, like the Phase One P 45, it remains appealing to increase the resolution for a while, since there is a demand for resolution, and their end-users do want to invest in resolution. For the main stream users they don't know what to do with the extra resolution. It is becomes a struggle to store all those big files, your notebook or computer is getting a harder job to work with all those larger files, etc. For those users other techniques are becoming more and more important. There will be continuing race, but it won't be 6 against 20 Megapixels, rather 6 against 8 MP. The second reason is technical boundary. A large sensor just doesn't fit in the small compact digital cameras, the pixels need to become smaller and smaller. And this influences the quality quite a bit. The challenge is, as said before, to improve the quality of the pixel itself. At the moment the pixel race is over, sensitivity will become more and more important. Question: What has been the biggest development in the digital sensors for the past years? Answer: Well over the last ten years and speaking to the market, it is the integration of CMOS devices in capturing images. On the CCD itself it's the way how to produce the sensor. We are now using the ITO process, which is a high end technical manufacturing process. Before this technique the top layer of the image sensor, with the electrons, was not transparent. So it was hard to get the voltage on the pixels and it was even harder to control it. With ITO the top layer is transparent, which increases the sensitivity and gives us a better control. Question: Do you think there will be an increase in the number of sold digital backs? Or will D-SLR take over that market too in the end? Question: What do you think is nowadays the main issue with the quality of digital imaging? For example is it the resolution, or the noise, or dynamic range? Answer: That is a question one should ask to the manufacturers like Phase One and Hasselblad. We are only making the sensors. Answer: Kodak ISS will not define this challenge. We are doing just what we are told to do. Basically, the client is asking us for a kind of sensor and how it should perform. Our clients are looking for an increase of resolution and at the same time the sensor has to perform better than its predecessor. But as you know a higher resolution in combination with the same size of the sensor will mean smaller pixels. This will influence the noise ratio, dynamic range and a lot of other quality issues. This fact makes the job hard to do, in fact it is a real challenge. For now, our biggest challenge is to improve the quality of the pixel. So, from that point of view, we can improve the resolution without decreasing the image quality. Or for a matter of fact, if we don't want to increase the resolution, we can at least improve the image quality. And of course we can do it simultaneously, but it goes step by step. It is always making compromises, and in the end our clients need to tell us which aspect is the most important one. Question: What do you think we may expect in the (near) future? More pixels, more in-camera editing? Answer: About in-camera editing I can't comment to that. For the sensor the question will be about pixel quality. We are now also working in the CMOS area for mobile phones. There will be more work to get the CMOS moving into the main stream devices. But then again, for us it will be a matter of demand from our clients. Question: What will be the ultimate sensor? Answer: That is a good question. For the consumer market, I don't know if there is an answer to that question. The question itself is changing all the time. We have to work close to our customers to answer that question. But the customer has to define its needs. The ultimate sensor would have it all. You know we have plenty of good ideas, great innovations will be made, but there is always that search for that one click. That one click will give us an answer on how to implement all those ideas into the next generation image sensors. It makes our task challenging, and interesting.